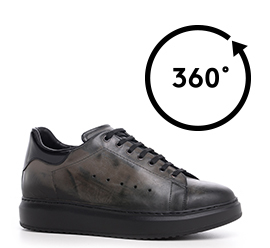 Handmade sneakers with 2.6 inches (6.5 cm) inner elevator system featuring upper in brushed calfskin embellished with patent leather details. The sole made of ultralight rubber ensures maximum comfort. A casual elevator shoe with a vintage design ideal too match any outfit.